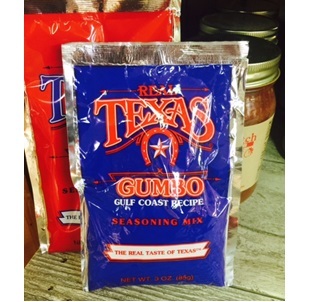 "Real Texas Gumbo Seasoning Mix has the taste of the Texas gulf coast. It is blended from premium quality ground chili peppers and specially selected spices. Simple instructions make this an easy and delicious meal, sure to please! So easy to make and you can feed a crowd! Makes 3.5 quarts of some of the best tasting chili this side of the Red River." Boil cut-up chicken in 1 qt. water until tender. Remove chicken, de-bone & cut into pieces; reserve stock for later. In large kettle, brown 4 tablespoons each flour & oil to make a roux. Slowly stir stock into roux, then add 1 package Real Texas Gumbo mix, 1 cup chopped onion, one 16 oz can tomatoes and 4 cups fresh or frozen chopped okra. Add de-boned chicken and let simmer 1 hour; stir occasionally. Makes about 2.5 qts. Enriched wheat flour, salt, hydrolyzed soybean protein, dextrose, dehydrated onion, modified food starch, sugar, soybean oil, parsley and spice extractions, a special blend of spices, and garlic.